Does Fish Oil Make You Stink? Fish oil is an excellent source of the omega-3 fatty acids eicosapentaenoic acid, or EPA, and docosahexaenoic acid, or DHA, which are associated with several important health benefits. In nutrition and naturopathic medicine, practitioners widely recommend fish oil supplements to treat and prevent common conditions. Although generally safe when used in moderate doses, fish oil can cause several unpleasant side effects, including body odor. Fish oil provides several health benefits due to its high concentration of DHA and EPA. The University of Maryland Medical Center, or UMMC, notes that these compounds have anti-inflammatory effects and promote cardiovascular health. DHA and EPA can reduce triglyceride levels, thereby decreasing a person's risk of heart disease. Fish oil supplements may also help to prevent neurological illnesses and age-related macular degeneration. Body odor is a common side effect associated with fish oil. According to the National Institutes of Health, or NIH, the most common complaints among fish oil users include nausea, belching and acid reflux. This fishy reflux can lead to halitosis, or bad breath. In large doses, impurities in the supplement may trigger a pervasive, fishy body odor. Fish oil users may experience more foul-smelling sweat and body oil. Some people may even stop using the supplement because of these embarrassing side effects. Fish oil is available in several forms, and some may be more likely than others to cause body odor. Unpurified liquid fish oil often has a powerful odor similar to rotten seafood. Other liquid fish oil supplements are distilled to remove foul-smelling impurities, but they still trigger nausea and fishy-smelling reflux. Fish oil is most commonly sold as a capsule; these vary in their potency and purity. Other manufacturers sell enteric-coated fish oil capsules, which dissolve in the intestines rather than stomach or esophagus to avoid gas or other discomfort. Several remedies can reduce odor-causing side effects associated with fish oil. The NIH advises patients to freeze fish oil capsules and take them with food to reduce reflux, belching and halitosis. 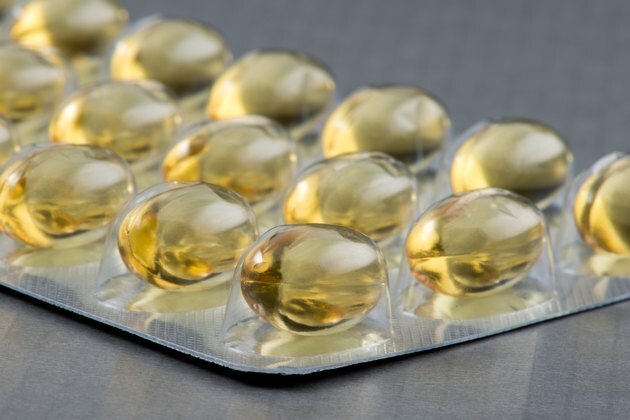 The UMMC acknowledges that enteric-coated fish oil supplements may have fewer unpleasant side effects than uncoated alternatives. Consult your health care provider if you experience persistent side effects from fish oil. Fish oil is only rarely associated with serious side effects, but it would be prudent to ask your health care provider before using it if you have a medical condition. The NIH notes that fish oil can worsen symptoms of liver disease, bipolar disorder, diabetes and HIV/AIDS. Fish oil supplements may also trigger cardiac arrhythmia in people with implanted defibrillators. As a precaution, always tell your primary care provider about any drugs and supplements you take.